Project modern style and create beautiful earthy, exotic sounds with Imbarimba. This African inspired 22 key musical instrument combines elements of a marimba (wooden xylophone) and kalimba (thumb piano). 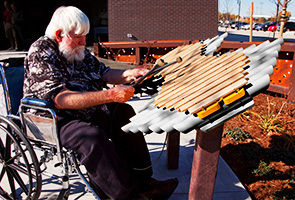 Imbarimba encourages musical exploration and never plays a note out key—great for all-ages, abilities and musical background. Mallets are included and attached to the frame via nylon-coated stainless steel cables. 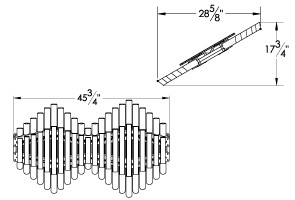 Displaying a rolling hill pattern, each of the fiberglass musical keys are backed by individual, rounded anodized aluminum resonators and attached to a HDPE frame. Precisely spaced and secured, the note bars are strung together utilizing braided stainless steel cable, holstering HDPE frame.